Alan Trounson, president of the California stem cell agency, has sent a letter concerning disclosure of the names of 18 companies who expressed an interest in applying for grants from the $3 billion research program. Trounson wrote the letter to the companies after Consumer Watchdog revealed the names that CIRM had attempted to keep confidential as part of its pseudo policy of secrecy. Pseudo because CIRM chooses to keep some names secret and reveal others. And many of its public grant review summaries contain enough information that any reasonably well-informed person can determine the identity of the applicant should he or she want to make the effort. In his letter, Trounson expressed regret about the disclosure and said that CIRM has issued a "reminder" concerning its confidentiality policies. "From what I've heard, representatives of companies on the list are talking with each other about why it was only one of the 18 companies, Novocell, received an award. They're comparing notes about the grant review process and how they feel it was biased against for-profit entities. "There's a good chance they will work together as a group and take their concerns to the stem cell oversight committee, possibly as early as its September meeting. "See what happens when a little light shines in?" The California stem cell agency will be looking to Gov. Arnold Schwarzenegger to gallop to its rescue and veto legislation aimed at ensuring affordable access to state-financed stem cell therapies. The bill cleared the Assembly on Monday, 64-7, and now is only one step away from hitting the governor's desk. It will only take Senate concurrence in Assembly amendments to send the measure, SB1565 by Sens. Sheila Kuehl, D-Santa Monica, and George Runner, R-Antelope Valley, to the governor. So far the governor has not taken a position on the legislation, although he has been a friend indeed to the stem cell research program. A couple of years ago when CIRM was in financial straits, he loaned it $150 million, which has since been repaid with the state bond funds that finance CIRM's efforts. On more than one occasion, he has cited CIRM as evidence of doing good, both economically and scientifically. CIRM and industry groups object to Kuehl's bill because it would lock into state law requirements that the agency contends would hamstring it in connection with negotiations with biotech companies. CIRM also objects to a provision that would lower a barrier to the funding of non-embryonic stem cell research. Reporter Ron Leuty of the San Francisco Business Times wrote about the provision last month, noting that it was inserted at the request of the conservative Runner, who opposes to human embryonic stem cell research. "We may be handing a political victory to people opposed to human embryonic stem cell research that hasn’t been earned and that isn’t supported by the science." The issue, however, is of little notice in the Capitol, where lawmakers and the governor are embroiled in a nearly two-month stalemate that has become the California budget crisis. The governor has ordered the layoff of 10,000 state employees and seeks to cut the pay of 200,000 state employees to the federal minimum hourly wage of $6.55 until a budget is passed. The spending measure is being blocked by Republicans, who can do so because it requires a two-thirds vote. One could speculate that the CIRM legislation could get caught in that battle. Schwarzenegger needs some Republican votes for a budget. Perhaps he could generate a couple by signing the legislation, arguing that he is acting to support stem cell research that does not destroy human life. Five directors of the $3 billion California stem cell agency have missed 60 percent or more of its board meetings this year, the Consumer Watchdog group reported today, declaring that there is "no excuse for flagrant absenteeism." John M. Simpson, stem cell project director for the Santa Monica, Ca., group, said directors who cannot attend meetings should resign. Simpson disclosed the attendance performance in a news release after doing an analysis of meeting records since 2006 of the board of directors, which is known as the ICOC. Here is key paragraph on this year's attendance, which includes names, affiliation and designated slot occupied on the board. "The worst attendance records for the five meetings this year, according to ICOC minutes, are: Marsha Chandler, executive vice president and chief operating officer, Salk Institute, an executive from a California Research Institute (20 percent); Jonathan Shestack, founder & vice president, Cure Autism Now, patient advocate mental health (20 percent); Tina S. Nova, president and CEO of Genoptix, executive officer of a commercial life science entity (40 percent) and Marcy Feit, president and CEO Valley Care Health Systems, patient advocate Type II Diabetes, (40 percent)." Also absent from 100 percent of meetings this year is John Reed of the Burnham Institute, who has recused himself during a state investigation into conflict of interest violations involving Reed's attempt to influence CIRM staff on a grant application. "At this month’s ICOC meeting Chairman Bob Klein was urging members to act quickly because the board would lose a quorum in 25 minutes. That’s no way to make substantive decisions affecting a $6 billion (including interest) program." "Patients hoping for stem cell cures rightly expect 100 percent commitment by board members. If they can’t do that, the fair thing for everyone is to step aside." "Janet Wright — 15 of 15 — 100 percent." The Consumer Watchdog group today pulled away a bit of the veil of pseudo-secrecy that surrounds much of the grant process at California's $3 billion stem cell agency. CIRM – most of the time – refuses to disclose the names of enterprises or individuals seeking its taxpayer-financed largess, unless they have actually won some CIRM cash. However, the agency chooses to identify applicants when it is convenient for CIRM purposes, as was the case in the mammoth lab grant program earlier this year. John M. Simpson, stem cell project director for Consumer Watchdog of Santa Monica, Ca., has long contended that good government practices demand the release of the names of those who seek funding from the state of California. Today on his blog, he disclosed the names of 18 companies that were looking for grants from CIRM. Only one, Novocell, eventually received a grant, despite oft-expressed desires by some CIRM directors that California companies should receive the benefit of state financing. Simpson noted that some rejected business applicants have complained about CIRM's review process, contending that it "is skewed towards academic science." Some CIRM directors have also questioned the approach of its scientific reviewers, saying that they may overlook worthwhile efforts that are heavily focused on bringing cures into the hospital. Simpson suggested that the companies he identified might want to get together and talk. "Here's the list of firms which filed an LOI (letters of intent) to apply for the Disease Team Planning Grant: Advanced Cell Technology, Alameda; BioCardia Inc., South San Francisco; DNAmicroarray Inc., San Diego; Genomics Institue of Novartis Research Foundation, San Diego; International Stem Cell Corp., Oceanside, Novocell, San Diego; Panorama Research Inc., Mountain View; RegeneMed Inc., San Diego; StemCyte Inc., Covina; and Stemedica Cell Technologies, San Diego. The headline talks about the "dark side" of stem cells, but the piece was a bit of good news for the University of California, Davis, and particularly one man there who just won $2.2 million from the California stem cell agency. Reporter Carrie Peyton Dahlberg of The Sacramento Bee reported this week about Paul Knoepfler(pictured), a scientist who recently received a faculty award grant from CIRM that he calls a "booster rocket" that will nearly double the budget of his lab. "His target is a gene that causes tumors – and that can transform adult skin cells into versatile stem cells similar to those in embryos." "I'm very optimistic. I don't think the hurdles we're facing are insurmountable." Dalhberg also quoted Meri Firpo of the University of Minnesota and Joseph Wu of Stanford, commenting favorable on Knoepfler's work. The Bee piece triggered one reader remark on its website that expressed appreciation for an objective report. The anonymous commentator said it was one of the few articles that have addressed the cancer risk involved in stem cell therapies. UC Davis has received $38 million from CIRM during the last three years. The dean of its medical school, Claire Pomeroy, is listed as one of the 100 most powerful persons in Sacramento (along with Gov. Schwarzenegger) by Sacramento magazine. Pomeroy is also one of the 29 directors of the state stem cell agency. Interestingly, she is not quoted either in The Bee article or the press release from UC Davis on Knoepfler. We assume that is the result of her own choice. Probably a good position to take considering the conflict of interest issues surrounding all the many academic and research executives who sit on the CIRM board and whose employers have benefited to the tune of hundreds of millions of dollars handed out by CIRM. We received the following from patient advocate Don Reed of Hayward, Ca. "Karen Miner’s and my weblog, www.stemcellbattles.com, is down. "Webmaster Karen(pictured) is in hospital, recovering from bladder augmentation surgery. The operation was done in hopes of freeing her from many problems of a personal nature, related to her spinal cord injury of fourteen years. "We are in hopes she will recover fully, but for the foreseeable future, our small column, www.stemcellbattles.com, will not go forward. Karen was the webmaster; now her health will not permit her to carry on this unpaid chore. "Not only did Karen’s webmastery give me a voice, but she and I have worked closely together for more than ten years. She is a part of everything I have done in research advocacy. Co-chair of Californians for Cures, Karen worked hard on the Roman Reed Spinal Cord Injury Research Act, Senator Deborah Ortiz’s stem cell laws, Bob Klein’s magnificent and unparalleled Proposition 71, and the four years continual defense of it afterward, in the unending attacks the California Institute for Regenerative Medicine has endured; always, Karen was there. "Paralyzed in body but never in spirit, Karen Miner is a constant source of inspiration to me and all who have the blessing of knowing her. "Anyone wishing to send Karen a get-well-soon email may send it me at: diverdonreed@pacbell.net. I will print them out and take them to her in the hospital. "Don’t send anything electronically complicated or fancy, no e-cards, please. I don’t know how to work that stuff. Thanks. News coverage of this week's $59 million in grants from the California stem cell agency was light today. Most of the stories were heavily focused on the local impact of the grants. All appeared to have been written from the CIRM news release as opposed to actual coverage of the directors meeting. Here is a listing of the stories we turned up. Here is a listing of the news releases from recipient institutions. Crafty. Ingenious. Resourceful. And dubious. All of which describe the events Tuesday night at the meeting of the directors of the California stem cell agency. As John M. Simpson of Consumer Watchdog of Santa Monica, Ca., put it, the board "essentially drafted a member from the audience" in order to achieve a quorum and to be able to act officially. "Assembling a quorum for the 29-member ICOC is never easy. It's comprised largely of high-powered academic and industry representatives. Moreover, Prop. 71 requires a super-majority. A quorum is 19 members." Tuesday night, board officials had expected the necessary number but for a variety of reasons, the panel was short. "Then as the board broke for dinner, Jacob E. Levin, Director of Research Development at UC Irvine, who was in the audience, asked Board Executive Director Melissa King what was necessary to serve as an alternate member. "His boss, board member Dr. Susan Bryant, was one of those who was unable to attend. Under the ICOC's rules, board members from universities and research institutions may appoint alternates if they can't make it. The designate must be an executive of the university or institution. "The lawyers determined Levin met the requirements, staff caught up with Dr. Bryant by phone, who agreed Levin could be her designate and after dinner the board got down to business. Chairman Bob Klein noted that Levin had been present for all the agenda items that had been discussed." In years of covering hundreds, perhaps thousands, of California governmental hearings, I have never seen anything quite like this. State lawmakers have occasionally been locked in their legislative chambers until their leadership gets a desired vote. Some lawmakers have been dragooned from their homes to come in for a vote. But nothing quite like the CIRM maneuver on Tuesday. Twenty-three California scientists hit it big today when the California stem cell agency awarded them grants that totaled as much as $3.2 million each. In all, directors of the agency gave away $59 million in its second round of Faculty Awards, which are designed to support "young" researchers and develop more talent in the area of human embryonic stem cell research,. The grants will support the recipients for as long as five years. They come at a time when competition for grants at the federal level is increasingly competitive. In a news release, CIRM Chairman Robert Klein noted that the average age of a researcher receiving his first grant from the National Institutes of Health is 43. Presumably, today's CIRM recipients are younger, but the agency did not specify their average age in its news release, which contains the names of the recipients and their institutions. Grant reviewers decided 20 grants were unequivocally worth funding. Directors added three more from the second tier of applications, which reviewers say are worth approving if funds are available. Nine more grants remain in that category and will be considered at next month's directors meeting. A final vote will also be held then on the 22 applications not recommended for funding by reviewers. Fifty-four applications were received. Today's grants come on top of a similar round approved last December. CIRM gave away $54 million then to 22 scientists. However, that round was tainted by conflict of interest violations by some CIRM directors, that caused the agency to reject 10 applications. Directors then decided to go ahead with another round of Faculty Award grants. Initially CIRM budgeted $41 million for 14 recipients in the latest round of Faculty Awards. CIRM did not explain the rationale for increasing the program in its news release today. Only hours before its directors meet today, the California stem cell agency has posted its proposed policy for handling requests for reconsideration of negative recommendations from reviewers on grant applications. The proposal is an attempt to deal with a problem that has dogged CIRM since last January when an unhappy applicant asked the board to approve its grant despite a negative decision by reviewers. The board was clearly uncomfortable with the attempt, both in terms of fairness to other applicants and because of the disruption of its normal procedures. The issue surfaced once again in June, leading to more extended public discussion of the appeal or reconsideration process. CIRM allows "appeals" only in the case of conflicts of interest on the part of reviewers. However, reviewers do not have to publicly disclose their economic or professional interests. The proposed procedure requires the applicant to file a request for reconsideration five days prior to a directors meeting. CIRM's president will then evaluate it and make a finding on whether it has merit. The proposal is unclear on whether it means calendar days or business days. The reconsideration requests, which CIRM calls "extraordinary petitions," will be posted on the CIRM website. Presumably the president's findings will be as well, although that is not specified. The policy does not appear to eliminate an applicant's ability to appear publicly before the board to seek reconsideration. However, with a negative decision from reviewers and a "no merit" finding from the president, a disgruntled applicant is not likely to find a receptive audience. It is unfortunate, to say the least, that this important proposal, which affects hundreds of scientists in California, has been posted at the very last minute. It deals with an issue that affects CIRM's credibility and the credibility of its reviewers. It is virtually impossible for those affected by this plan to comment intelligently to the board in a timely fashion. Presumably, they could send an email with their comments at this late hour – if they are aware of the details of the proposal. It is our sense, however, that few scientists spend much time scouring the depths of the CIRM website, which does not even put a notice of its directors meetings on its home page. Directors of the California stem cell agency this week are scheduled to discuss legislation aimed at dealing somewhat with the recent upsurge in attacks on California researchers, including at least one of its grantees. On the agenda for either tomorrow or Wednesday is AB2296 by Assemblyman Gene Mullin, D-San Mateo. It has already passed the Assembly and is now in the Senate Public Safety Committee in a heavily amended form. "Any person who enters the residential real property of an academic researcher for the purpose of chilling or interfering with the researcher's academic freedom is guilty of trespass, a misdemeanor." While we are adamantly opposed to the domestic terrorism that has targeted researchers in this country, we cannot support the Mullin bill. Nor should CIRM. The legislation is vague and raises major constitutional issues regarding freedom of speech. Existing law already provides a wide array of tools dealing with trespass, as the legislative analysis points out. The measure is certain to be challenged by such enterprises as the ACLU. Who knows what "chilling" a researcher's academic freedom means? And one wonders exactly why persons engaged in labor union activities are specifically exempted from the terms of the proposed law. If you are interested in winning a grant from the California stem cell agency, you may want to pay special attention to proposed policies that define the eligibility of a principal investigator and spell out the amount of time he or she must commit. The proposal, which also deals with limits on the number of applications, will come before the directors of the agency tomorrow or Wednesday. The actual text of the recommendations was not available on the CIRM website until today. The document does not make it explicitly clear what the purpose of the plan is. However, CIRM has sometimes been flooded with grant applications, creating an extraordinary burden on its staff and reviewers. The document also attempts to deal with the question of co-principal investigators, which seems to be an issue involving a grant that includes multiple institutions. You can find a discussion of this in the transcripts from the June directors meeting (v. 1) and their March session. "CIRM, in contrast to the NIH, has a limited lifespan in which to accomplish its mission. Funding is commensurate with a sense of urgency to accomplish the mission that should be matched by a commensurate effort by key personnel, especially the PI and Co-PIs. "Therefore CIRM, mindful of the urgency of its mission, will require a minimum percent effort of the PI (and Co-PIs), typically 10%, where it deems such minimum effort is necessary to ensure PI (Co-PI) oversight and timely accomplishment of the proposed research. Extraordinary circumstances may be applied by CIRM, at the discretion of the President, to allow senior research scientists to have reduced percent effort commitment in the interests of obtaining the best outcomes for a research project. CIRM and the Task Force agree that no changes will be made to the GAP in order to maintain flexibility." The California stem cell agency has posted its latest proposed policy for its incipient $500 million biotech loan program, which will be discussed at this week's meeting of its directors. The policy statement is reasonably clear, but it does not deal with the risk involved. Nor does it explain exactly what CIRM might do with the warrants it takes in the companies it lends to. Will it hold them, trade them or eventually wind up owning stock in a number of biotech firms? If it owns stock, how will it be voted and under what conditions will it be sold? Who makes those decisions – CIRM directors, the CIRM president or chair? Here is one excerpt from the policy document, laying out the purpose of the proposal. "The goal of a loan program is to fund the translation of research into research tools, medical diagnostics and devices, and therapeutic products. These loans will be targeted at the funding gaps in product development that will serve to leverage participation by follow-on investors, such as venture capital and other capital markets, and result in more products that enter the market." Here is the text of a piece on the CIRM biotech loan proposal that ran Aug. 7, 2008, in BioWorld Perspectives. Editor's note: David Jensen is the publisher of the California Stem Cell Report and has written more than 1,700 items involving CIRM since 2005. California wants to help biotech enterprises navigate through the industry's famed financial "valley of death" with a $500 million loan program. It comes at a good time for the bio biz. Money is tight, but in the Golden State, one agency has $3 billion to spread around for research and clinical trials. The cash comes from the California Institute for Regenerative Medicine (CIRM), the state's unprecedented stem cell research funding organization. It was created less than four years ago under Proposition 71, a California ballot initiative that surfaced in reaction to President George W. Bush's restrictions on human embryonic stem cell research. Using funds from California state bonds, CIRM has already handed out more than $554 million in grants. Today, the agency is the largest source in the world for funding for human embryonic stem cell research. But CIRM is not without controversy. Recently some disgruntled grant applicants have complained of unfairness in reviews. Some in the biotech industry object to CIRM's rules for sharing the wealth from any state-financed therapies. And there is at least one catch to CIRM's plans to loan $500 million to biotech firms. Recipients of the state's bounty are going to need a California connection — probably a fairly strong one — since state law says CIRM's cash must be spent generally in California. But it probably wouldn't be too hard for an enterprising business to accommodate those needs if it wants, let's say, a $25 million loan. Policies for the biotech loan program are likely to get the go-ahead next week from CIRM's board of directors. The main reason for its expected approval is CIRM Chairman Robert Klein, a multimillionaire real estate investment banker who has served in his state stem cell role without pay since 2004. His real estate background has taught him the value of financial leverage, which is exactly what the loan program is about. The loan effort is Klein's brainchild, conceived as a way to not only help biotech enterprises (both for-profit and nonprofit), but also to extend the life of the state's stem cell effort. It is limited by law to only 10 years of state bond funding and currently has no other source of income. According to a PricewaterhouseCoopers report commissioned by the agency, Klein's plan could generate at least a $100 million profit, although state government delicately avoids the use of the word "profit." The earnings then could be channeled back into more grants and loans. With expectations that default rates could soar as high as 50 percent in some cases, that seems to be almost too good to be true. There are skeptics, but not many public ones. The reason for high defaults? The loan program would target firms that otherwise could not find financing because they are wallowing in the "valley of death," a loose term that describes the financially difficult period between grant and "angel" financing and funding from venture capitalists. PricewaterhouseCoopers performed an analysis of the proposal based on assumptions provided by the agency. They included a $500 million portfolio, disbursed over a seven-year period, loans up to $5 million, interest rates ranging from prime plus 2 percent to 4 percent with possible warrant coverage from 10 percent to 100 percent. Pricewaterhouse concluded, "Total assets of the program could increase from $500 million to between $600 million and $1 billion over 10 years." Klein, however, has indicated that changes are likely in those assumptions. During a May meeting of CIRM's Finance Subcommittee, he indicated larger loans should be given and other changes be made to improve the proposal. "It may take a very significantly sized loan, even on a matching fund basis, for companies to get through the preclinical, Phase I, and Phase II and Phase IIb stage before private capital would be prepared to step in," he said. Klein said he plans to bring in Ed Penhoet, vice chairman of CIRM, co-founder of Chiron Corp. and currently a venture capitalist, to beef up his call for hefty loans. Reception of the loan program by industry has generally been favorable. But some have raised questions. Menlo Park, Calif.-based Geron Corp., for example, said the loan sizes initially assumed in the Pricewaterhouse analysis were too small. Other hurdles remain as well. The Consumer Watchdog group of Santa Monica, Calif., has expressed concern about potential conflicts of interest. The nonprofit advocacy organization cited the possible use of delegated underwriting. CIRM Director Duane Roth, as well, has raised a flag about potential conflicts involving underwriters. Klein had suggested the use of underwriters because of the small size of the CIRM staff (between 30 and 40 persons) and its lack of lending expertise. At one point, Klein cited Fannie Mae as an example of how underwriting could be used with biotech loans. But given the recent financial news about the Federal National Mortgage Association, it seems unlikely he will mention that enterprise again. CIRM's biotech loan plan seems innovative, filling an important need in the biotech industry. The plan, however, does involve a substantial risk of public funds that has not been fully explained in a straightforward manner. Given today's difficult economic times and unease about aggressive lending practices, a clear explanation is certainly in order. The public, California lawmakers and industry should understand how it is possible that CIRM can turn a profit with default rates as high as 50 percent and the risks involved. CIRM is a young government department and should move with caution in order to maintain public trust. Major failures in a biotech loan program could damage CIRM's credibility and cast a pall over its other important activities, including grants, ethical research standards and intellectual property policies. Here are links to more information about the biotech proposal. The scientist at UC Santa Cruz whose home was firebombed earlier this month is a CIRM-funded researcher, holding a $500,000 grant to study differentiation of stem cells into motor neurons. 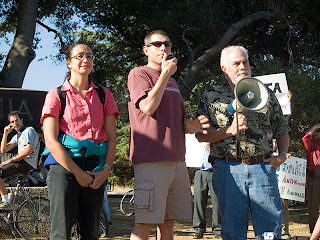 David Feldheim(center of photo), a molecular biologist, won the grant in 2007, one of the first scientists whose research was supported by California's $3 billion agency. Feldheim was the target Aug. 2 of animal rights activists, part of a recent upsurge in assaults on researchers. Authorities say the crime is being investigated as an attempted murder. The Los Angeles Times reported today that academics in the UC system are "angered and worried," but vow not to be intimidated. A $50,000 reward is being offered in connection with the firebombing with funds from the FBI, UC Santa Cruz, private citizens, the City of Santa Cruz, the federal government and the Humane Society, according to San Francisco Chronicle reporter John Cote. "Feldheim, his wife and two young children fled from a second-floor fire escape. Feldheim's feet were bruised during the escape. "Minutes later, outside a campus residence less than a mile away, a fire ripped through a station wagon belonging to a colleague. No one was injured in that incident. A third scientist received a threatening phone message at home about the same time." "In 2000 there were 10 such episodes against biomedical research facilities alone, and in 2006 that figure had grown to 77, according to the group's website. In addition, the type of attacks has changed in recent years. "'Prior to that, the vast majority of actions taken were against institutions -- break into the lab, steal the animals, trash the facility,' said foundation President Frankie Trull. 'More recently, however . . . they've become much more personal, attacking the researchers at their homes. California seems to be the focus of this activity right now, but not the only focus.'" The animal rights terrorism issue is not new to this writer. While at The Sacramento Bee, I was the primary editor on Deborah Blum's 1992 Pulitzer Prize-winning series, "The Monkey Wars," which explored the violence against research involving primates. What was abundantly clear then and even more now is the need for the public – not just academics – to speak out against this terrorism. The community needs to understand that the firebombers explicitly place animal life above human life. The perpetrators should find no shelter from misguided souls who think this is minor mischief. We have received an email from an anonymous individual on the "blog ban reaction" item last week. The person began by commenting on a description of the matter as "fascinating." Here is the full comment. "Your blog is the definitive source of information for all-things CIRM. It is widely read by researchers – here in California and around the world – by other government officials and staff, and by journalists. What you write shapes the perceptions and coverage of others. At a time when CIRM is receiving so little press attention, your voice is even more influential. The CIRM board is ill-served by its staff’s banning the California Stem Cell Report from the daily clippings. I doubt that most board members have (or make) the time to read your posts regularly. Perhaps CIRM is counting on that to keep criticism (particularly of its chairman’s ongoing behavior problems) hidden from the board. "Hopefully a few board members will ask that your blog be restored to CIRM’s press clipping reports. They all should. With two business days remaining before next week's meeting of the directors of the California stem cell agency, still missing from its website is important information needed for intelligent public participation in major issues facing CIRM. Missing background material includes a current draft of the proposed loan policy for a novel and risky $500 million biotech lending effort and the proposed procedures on how to deal with the sticky question of reconsideration of negative grant recommendations from CIRM reviewers. Also missing is some sort of discussion of what is meant by "recommendations on RFA applicant policies." The directors are scheduled to give away $41 million in research grants, but no link is posted from the agenda to the public summaries of the reviews. However, those went up on Thursday and can be found here. Hundreds of California researchers will be affected by the proposal for reconsideration of grant reviews. But for all practical purposes, none of them will have a say in the mysterious plan because there is not enough time for them to analyze the proposal – if it is ever posted – and to make travel plans to Stanford for the meeting that begins on Tuesday. The Californa stem cell agency has scored big PR-wise in the Friday edition of the Wall Street Journal. The influential newspaper, which has more than 1 million paid subscribers on its website, is carrying a laudatory piece about CIRM, focusing on its president, Alan Trounson. The headline? "Stem Cells' New Sugar Daddy." Science columnist Robert Lee Hotz described daily struggles with ethical and political challenges and an "air of urgency" at CIRM as well as a "second medical revolution" for Trounson. His first involved IVF. Hotz said the California's "speculative venture" may be "the world's most ambitious experiment in public funding for science." One might quibble with some of the details of the WSJ story, but it is a coup for CIRM. The WSJ has an influential audience with important links to business. The piece will help set the tone for future mainstream coverage of CIRM and expose it to many key industry and public opinion leaders who otherwise would never take notice. The story is also linked to an online discussion of whether it is okay to pay women for their eggs. The Monday item about CIRM banning this blog from the news clippings it sends to its directors and staff triggered a modest reaction this week, including a sharply negative one from the agency itself as well as warm endorsements of this website's endeavors. Some of the reaction was posted directly as a comment on the item itself. Other comments were sent directly to this writer, including two from Don Gibbons, chief communications officer for the $3 billion state program. He is the person who claimed responsibility for excising the California Stem Cell Report from the agency's official clips. "Using the term 'officially banned' is utter b----s---. We just chose to not use state money to distribute what is freely available on the Web. You should read the Chronicle’s Op/Ed piece this morning on the responsibilities of advocacy 'almost-journalists.'" "I want to reiterate that I think using 'officially banned' is incorrect, and scandalously misleading. It suggests folks here are instructed not to read your blog." Obviously, CIRM can do whatever it wants regarding the clippings it sends around, but its decisions are officially government action. And the blog is indisputably banned from the clips. As for Gibbons' assertion that CIRM does not distribute "what is freely available on the Web," nearly all of what CIRM circulates as clippings is freely available on the Web – not just this blog – at least based on the last version of the clips we saw. The "banned" item also attracted minor attention from other web sites, including Capitol Alert, a news tip service aimed at state Capitol denizens. "You must be doing something right"(email from writer who cannot be named). "If I had to guess, the 'ban' likely has increased your readership dramatically. When will those bureaucrats ever learn?" (From another person who cannot be identified). Only one negative comment about the blog was received. That was posted directly to the item and agreed with the CIRM ban because the blog is not about "science." As we responded, the blog has never been about primarily about "science," but primarily about public policy. We rarely deal directly with the science of an issue, but rather about the interplay between science and government, not to mention business, academia, politics and public opinion. Lying at the heart of CIRM is its public nature and public relationships. In many ways it is the quintessential public and political creature. It was created in that most political and public process – an election – through a mechanism (the ballot initiative) that was designed to give the great, unwashed masses the ability to wrest control away from their designated leaders. CIRM is an extraordinary and unique governmental experiment that has had a truly vast impact nationally and beyond. Some see it as a model for possible future endeavors seeking to solve some the intractable problems that plague our society. California's stem cell research program is worthy of considerable attention, far more than the mainstream media can or will provide. And that is part of the function of this blog. We try to generate more information than can be found in the media or on the CIRM website. We also comment on CIRM and analyze it in a way not possible at most major news outlets, which are hamstrung by standards that are useful but also allow them to be easily manipulated by governmental entities from the White House on down. Should the CIRM directors and staff be provided the California Stem Cell Report as part of their daily information diet? We think so. However, the spoon-feeding of boards of directors is not an uncommon practice in the world of business. It is also a poor practice that has backfired on more than one major enterprise. "We can’t afford, as a society, to limit our choices. We can’t even afford it financially, because Wall Street’s demands on Big Media are dumbing down the product itself." The California stem cell agency has altered its agenda for next Tuesday's meeting at Stanford, adding an element to its proposed human egg policy rules and an item dealing with eligibility on a new "translational" grant round. The agency also posted its latest version of how it would like to define California supplier, which is the key to giving preferences worth hundreds of million dollars to state businesses seeking to sell to CIRM grantees. The definition can be found here and seems to include almost any conceivable potential vendor in the state, but we could be wrong. At the same time, the California legislature is considering its own definition of California supplier in AB2381 by Assemblyman Gene Mullin, D-San Mateo. That measure is now on the floor of the state Senate. The item with eggs now says that directors will be asked to authorize "a procedure for petitioning the ICOC to designate stem cell lines derived before November 2006 as acceptably derived for use in CIRM-funded research, and to govern use of embryos created for reproductive purposes before August 13, 2008." Added was the language having to do with the Aug. 13 date. Also added to the next week's agenda is an item which states only: "Consideration of eligibility criteria in concept plan for Translational 1 RFA." The Fleishman-Hillard public relations firm has won a $115,000 contract from the California stem cell agency, according to odwyerpr.com. The website said Fleishman bested five other firms: Burson-Marsteller, Weber Shandwick, Feinstein Kean, GCI Group and Wundermarx. Odwyer reported that Ruby Barcklay, a senior vice president in Fleishman's San Francisco office, will be in charge of the account. The contract includes "media monitoring, leadership media training, opinion leader research in the biotech and business communities, and high-level targeted media placement around the organization's leadership position in the field of stem-cell research funding," according to the report. The California stem cell agency Tuesday posted background information on one item on its agenda for next week's meeting of its board of directors at Stanford. The California stem cell agency today posted the agenda for its Aug. 12-13 meeting at Stanford, along with some background material. The background material is a good start on helping the public understand what is to be discussed and acted on by the directors of the $3 billion public enterprise. We are looking forward to more in the next few days. The background information on one item has clarified what is actually to be discussed when directors take up "consideration of annual report on CIRM contracts and interagency agreements." On Sunday, we speculated that the item could be a proposal to change from quarterly to annual the reporting requirements to directors on outside contracts. In fact, the item appears to be simply the 2007-08 annual report on outside contracting expenditures. Draft language for a "grandfathering" provision on stem cell lines. Directors will be asked to authorize a procedure for petitioning them to designate stem cell lines derived before November 2006 as acceptably derived for use in CIRM-funded research. California's $3 billion stem cell agency has had enough! It has officially banned the California Stem Cell Report from information it circulates to its board of directors and staff. Some employees say staff morale has improved as a result, the agency declares. Like many other state agencies, CIRM collects news clippings and other information pertinent to its operations and circulates them to a selected audience. For some time (a couple of years, as we understand it), items from this blog were included in the electronic clippings sent to directors. They were also included in clippings sent to grant recipients. "Before I arrived, all citizen blogs, yours and (patient advocate) Don Reed’s, were dropped from the clips that went to the grantees because it was viewed as too much information they did not care about. They wanted the research news in the rest of the clips. But this required paying extra to create two sets of clips, sending the full clips with the blogs to the board and internal staff. I decided it was not worth the extra cost, and started sending the shorter version to everyone. The service has slipped up and let a couple of Reed’s columns get in, but I have asked them to make sure that does not happen. Eliminating both eliminates bias in the package, and frankly, several in-house staff have said morale has improved since your posts have been removed." But then we wondered about unordained flackery from various enterprises that has been distributed by CIRM as part of its official "news." Yes, Gibbons said in response to our question; PR releases are picked up from the Ascribe PR network, which specializes in pumping nonprofit-oriented publicity into mainstream newsrooms at as much as $300 a pop. Ascribe's clients include Scripps, Burnham, the University of California, AARP and the National Association of Social Workers. "After reading the California Stem Cell Report daily for more-than-two-and-a-half years, I know how dangerous and subversive it is. "I only let my wife read it under my direct supervision and would never contemplate allowing my adult children to see it." Aghast we were. Do you really mean that, John, we promptly emailed him back. "In this day of Google searches and alerts, I'm hard pressed to understand why anyone would pay anything to have any clips circulated. As for the California Stem Cell Report, I certainly don't agree with all the views expressed there, but I don't understand how anyone interested in CIRM and stem cell research would notoi check it daily. It has become the publication of record on all stem cell related issues in California. If I were CIRM's president I'd make it required daily reading for all employees and would encourage ICOC members to check it frequently." Directors of the California stem cell agency will meet next week to hand out $41 million to 14 lucky scientists and wrestle with a host of other matters, ranging from the $2.7 million in outside contracts to a proposed $500 million biotech loan program. Here is a quick look at the topics on the Aug. 12 agenda, which will probably be posted soon on the CIRM website. Researcher Bonanza -- This a bit of a "do-over" of last year's $85 million faculty award program. That effort was tarnished when five CIRM directors violated the agency's conflict-of-interest policies by writing letters on behalf of applicants from their institutions. CIRM said the letters resulted from an "innocent misunderstanding," but disqualified the 10 applicants involved. No CIRM action was taken against the five directors. The full board decided to provide another grant opportunity, which was also open to applicants other than those disqualified. The latest effort, modified from the first offering, is scheduled for $41 million for 14 winners, with awards up to $2 million a year. CIRM received 55 letters of intent to apply for the grants but has not released the actual number of applications as far as we can determine. Outside Contracting – Perhaps the most important item in the $13 million operational budget of the stem cell agency is the $2.7 million it spends for outside contracting. That figure is up 50 percent from last year. It is the second largest item in the budget, behind only salaries and benefits. CIRM will have spent more than $2 million for outside legal help by the end of this year and has spent hundreds of thousands for executive searches. In 2005, directors imposed restrictions on outside contracts and required quarterly reporting after they were surprised by published reports about the size and impact of those dealings. On Aug. 12, it appears that directors will be asked to reduce the reporting from quarterly to annual. That would be a mistake. CIRM's board should keep a close eye on the process because of importance of contracting to CIRM and the ticklish issues of overseeing those contractors. Earlier this year, directors had to retroactively approve additional funding for its main outside counsel, Remcho, Johansen, & Purcell of San Leandro, Ca., after work had already been performed. CIRM Chairman Robert Klein also told CIRM directors that Remcho is unique in its abilities, that basically no other firm in the state can perform the work. Thus, Klein reported, the attorney general's office has said the contract does not need to go out for bid. See the Remcho item below for more on Klein's explanation of the relationship between him, Remcho and CIRM and the opinion of the state attorney general. Here is the latest list of outside contracts. Here is the budget for 2007-08. The $500 Million or So Biotech Loan Program -- The formal agenda topic is "CIRM loan policy." CIRM Chairman Klein earlier this year said he hoped to have the biotech loan program approved this month. But this cryptic agenda item may mean that the board will not be presented this month with the whole package for this ground-breaking and novel effort. See the item below for links to various CIRM documents on the loan proposal. Search this blog on the term "biotech loans" for even more. Definition of California Supplier – Perhaps hundreds of millions of dollars are at stake in this item. It involves the Prop. 71 requirement that California suppliers be given preference on purchases by CIRM grantees. Legislation is being considered in Sacramento along with separate regulatory language being worked out at CIRM. Here is a link to the latest version of the legislation involved and the transcript of the June CIRM directors meeting at which the topic was discussed briefly. This is an area that has changed swiftly and may well again even before next week's meeting. Grant Appeals – CIRM is wrestling with the issue of how to handle requests for reconsideration of negative recommendations from the Grant Review Committee. Basically CIRM directors follow the recommendations from reviewers and have been uncomfortable with the few public attempts to override the Grants Committee. Two items could be related to this subject: One deals with RFA applicant policies and the other with creation of a policy for dealing with "extraordinary petitions" to directors for grants. Search this blog on the term "grant appeals" for some background stories, including a proposal by CIRM director Jeff Sheehy. Egg Matters – Directors will be asked to authorize a procedure for using stem cell lines derived before November 2006 in CIRM-financed research. A subtext of this involves the looming question of egg shortages and cash, although it is not formally on the agenda. CIRM President Alan Trounson has said researchers are "floundering" because they do not have enough eggs. If this subject is important to you, you should be at the meeting. The California stem cell agency has a no-bid, $2 million, special relationship with the law firm of Remcho, Johansen, & Purcell of San Leandro, Ca. The firm has had a contract with CIRM since the agency's earliest days. On May 28, the Governance Subcommittee of CIRM directors was asked to act in a retroactive fashion to increase Remcho's contract for 2007-08 from $250,000 to $415,000 to pay for bills for April, May and June. That amounted to a $165,000 or 66 percent increase in the contract. Based on the transcript of the meeting, it is not entirely clear who authorized the Remcho work without having the subcommittee first actually approve an increase in the contract. CIRM policies require approval by the governance panel if contracts exceed $250,000. CIRM Chairman Robert Klein, however, offered the explanation for why the work was needed, which included reviewing requests for applications for grants and work on state bond offerings linked to CIRM. CIRM contracts with Remcho totalled $1.1 million from January 2005 to July 2007 and are slated for $450,000 this year. John M. Simpson, stem cell project director for Consumer Watchdog of Santa Monica, Ca., asked Klein at the meeting whether the Remcho contract would be put out to bid in the future. Here is the exchange, based on the transcript of the session. "...(T)his is a substantial legal contract, and it's down as probably going on into the future. Is there an expectation that this would be put out formally for bid?" "This is a contract that is obviously where the expertise is built upon a number of years of research and development on this initiative specifically. And at the time we originally entered into this contract with Remcho back in 2004, I personally went to the (California) attorney general's office and asked, given the specialized knowledge of the Remcho firm had in spending two years on the research and drafting of this with me and four other attorneys that I had in specialized areas, whether we needed to put this to bid. "The attorney general's position at that time was we did not because of the specialized nature and depth of knowledge of the firm. It would be a huge bill to get any other firm to get up to the level of knowledge about this initiative and the tremendous amount of research that went into all of its development as well as all the public policies that have subsequently been developed." Patient advocate Don Reed sent along the following concerning legislation aimed at ensuring affordable access to taxpayer-financed stem cell therapies in California. He focuses on another element of the bill, which changes voting requirements on research that is not directly related to human embryonic stem cell inquiries. Reed, vice president of Americans for Cures, has been campaigning vigorously against the bill, SB1565 by Sens. Sheila Kuehl, D-Santa Monica, and George Runner, R-Antelope Valley. Many of Reed's efforts surface on the Internet at his blog, stemcellbattles.com. Among other things, Reed is drumming up a letter-writing campaign (better than emails, he says) against the bill. We checked into his blog recently and saw his account of the hearing last month on SB1565 in the Assembly Appropriations Committee. He noted that CIRM Chairman Robert Klein testified against the measure. It was Klein's first public appearance as chairman of CIRM before a legislative committee. Klein refused to appear before a committee in 2005 and instead launched a national effort among patient advocate groups against those proceedings, triggering a certain amount of unhappiness among some state lawmakers. The Americans for Cures lobbying group was created by Klein and operates out of the same Palo Alto, Ca., address as his real estate investment banking firm. SB1565 is now on the Assembly floor. If it passes as expected, it will go to the Senate for concurrence in Assembly amendments and then to the governor. "As the father of a paralyzed young man, (Roman Reed, who inspired the Roman Reed Spinal Cord Injury Research Act, source of America's first state-funded embryonic stem cell research) I strongly oppose Senate Bill 1565 (Kuehl,Runner). "Please be aware that the bill has changed since you first saw it. The bill now contains a poison pill amendment, offered by Senator George Runner, a known opponent of the California stem cell research program. The Runner amendment not only defies the will of the voters, but may violate the California Constitution. --Article XXXV of the California Constitution: Section 5, Chapter 3. California Stem Cell Research and Cures Bond Act, Article 1. 125290.60. "As you know, our stem cell program may only be amended to '…enhance the ability of the institute to further the purposes of…the measure…'—Section 8, Amendments. "And Senator Runner’s amendment, recently added to SB 1565? "This turns our program upside down! Proposition 71 was enacted by the voters to give priority to forms of stem cell research not likely to be funded by the federal government. The Runner amendment removes that priority, and would instead allow precious research dollars to be spent on 'any other scientific and medical technologies'. That could be almost anything; a bedpan is a piece of medical technology. "How can such a complete reversal be said to “further the purposes” of our stem cell program? Such seeming violations of the Constitution are almost certain to invite legal actions; have we not had enough lawsuits, enough delays? "The original intention of SB 1565, to guarantee access of stem cell therapies to the uninsured, has already been achieved, and without the need for this bill. Bill author Senator Sheila Kuehl, a highly respected legislator, has publicly stated that she and CIRM (California Institute for Regenerative Medicine) are 'on the same page' regarding how low-income residents could receive benefits from CIRM-developed products. "But the Runner amendment could gut the California stem cell program. "Those who know, oppose. SB 1565 is opposed by the Coalition for the Advancement of Medical Research, which is a board of more than 80 medical, educational, and disease advocacy groups: as well as every other stem cell research support group which has taken a position on the issue. "On behalf of every California family with a loved one suffering from chronic disease or disability, I urge your 'NO' vote on Senate Bill 1565, when it comes before you for concurrence. Vice President, Public Policy, Americans for Cures"
CIRM Communications Chief Don Gibbons pointed out today that Amy Adams did all the hard work to bring together the useful grant information mentioned in the "CIRM Website Improves" item. A good job indeed. Adams is communications manager at CIRM and works for Gibbons. We should also mention Alan Trounson, CIRM's president, who last January identified web site improvement as one of his priorities.